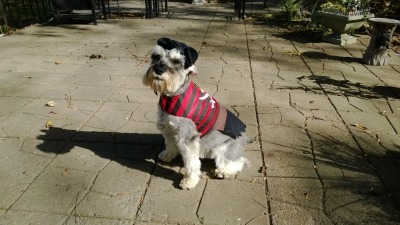 Pepper is a recuse Mini Schnauzer from Mason City, Iowa. His owner had small grandchildren that did not blend well with Pepper and the Humane Society was not prepared to take children so Pepper was placed for adoption. Our sister, Beverly, traveled to Mason City after I pointed out Pepper's information on the internet to her. She recently lost her little schnauzer, Ziggy to diabetes, actually, complications from the illness and missed the companionship of her little dog. Bev, passed away accidentally and my other sister and I took Pepper home with us. He will never be up for adoption again as he is in his "Forever Home". When I come home from work he meets me at the door with his chew bone and he jumps, wiggles, dances and squeals, yes, squeals. I love the warm welcome home I get every time I return. It doesn't matter if I just took the trash out or have been gone for a week the welcome is always the same!!!! They are the sweetest loving dogs in the world all they want is humane compaintionship,thank you for taking him in,he is beautiful and will love you beyond anything!!! !